The sitter's daughter, Matilda White Massy [1799-1883], Killakee, County Dublin, Ireland, who married Hugh Hamon, 4th Baron Massy; their son, John Thomas William Hamon, 6th Baron Massy [1835-1915], Killakee, County Dublin Ireland; sale of his estate at Killakee (J.H. North & Co., Dublin, 16 February 1916, no. 622); bought by T. K. Laidlaw, Castleknock, Ireland; (T.H. Robinson, London); (M. Knoedler & Co., New York, October 1919); purchased 11 December 1919 by Thomas B. Clarke [1848-1931], New York; his estate; sold as part of the Clarke collection on 29 January 1936, through (M. Knoedler & Co., New York), to The A. W. Mellon Educational and Charitable Trust, Pittsburgh; gift 1942 to NGA. For the family genealogy see Burke's Genealogical and Heraldic History of the Peerage, Baronetage and Knightage, 104th ed., London, 1967, 1672. The date of the sale appears in a cablegram from North & Co. in Dublin, dated 9 February 1916, to Charles Henry Hart in New York (typed copy, NGA curatorial file) and in a letter to Hart from Laidlaw, Castleknock, Ireland, dated 5 March 1916 (Charles Henry Hart Papers, Archives of American Art, Washington, D.C.). No catalogue for the sale has been located. Letter, 29 April 1989, from Melissa De Medeiros, librarian, M. Knoedler & Co., in NGA curatorial file. The name of the seller and the date of purchase are recorded in a copy of Portraits by Early American Artists of the Seventeenth, Eighteenth and Nineteenth Centuries Collected by Thomas B. Clarke, Exh. cat., Philadelphia Museum of Art, 1928, annotated with information from files of M. Knoedler & Co., NY (copy in NGA curatorial records and in NGA library). Portraits Painted in Europe by Early American Artists, The Union League Club, New York, January 1922, no. 16. The Face of American History, Columbia Museum of Art, South Carolina, 1950, no. 10. American Portraits from the National Gallery of Art, High Museum of Art, 1951, no. 11 (organized by the Atlanta Art Association). Extended loan for use by the Ambassador, U.S. Embassy residence, East Berlin, German Democratic Republic, 1974-1977. Extended loan for use by Ambassador Henry A. Catto, U.S. Embassy residence, London, England, 1989-1991. Extended loan for use by Ambassador Raymond G. H. Seitz, U.S. Embassy residence, London, England, 1991-1994. Barratt, Carrie Rebora, and Ellen G. Miles. 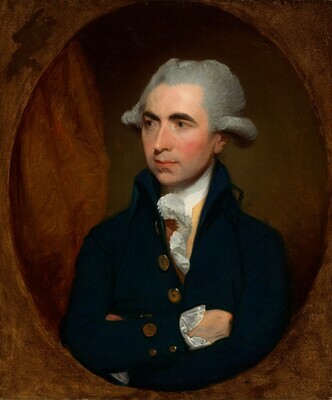 Gilbert Stuart. Exh. cat. The Metropolitan Museum of Art, New York; National Gallery of Art, Washington, D.C. (for the National Portrait Gallery). New York, New Haven, and London, 2004: 76, 137, 193, fig. 47. Herbert, John Dowling. Irish Varieties. London, 1836: 235-236. Park 1926, 806-807, no. 902, repro. Watson, Ross. "Irish Portraits in American Collections." Quarterly Bulletin of the Irish Georgian Society 12, no. 2 (April-June 1969): 40, repro. 47. American Paintings: An Illustrated Catalogue. National Gallery of Art, Washington, 1980: 237, repro. Williams, William James. A Heritage of American Paintings from the National Gallery of Art. New York, 1981: 62, repro. 63. Crean, Hugh R. Gilbert Stuart and the Politics of Fine Arts Patronage in Ireland, 1787-1793: A Social and Cultural Study. Ann Arbor, Michigan, 1990: 227, 266-267, 405 no. 84. American Paintings: An Illustrated Catalogue. National Gallery of Art, Washington, 1992: 346, repro. Miles, Ellen G. American Paintings of the Eighteenth Century. The Collections of the National Gallery of Art Systematic Catalogue. Washington, D.C., 1995: 177-179, repro. 178.